If you’re hungry, you might want to wait to read this blog from Kelsi McBrayer, a senior at the University of Arkansas. Yum! I have never been to Greece, so when I got ready for this trip I made a promise to myself to eat lots of good food and document it all. I follow this really cool Instagram account called @foodintheair that posts pictures of good food in really cool places. Because I am eating great food in Greece, I decided it was worth it to share it with the world. Of all of the food I have eaten and restaurants we have gone to, I have narrowed it down to my 3 favorite restaurants/dishes so far in Greece. 1. Souvlaki Bar – A restaurant within walking distance from our hostel in Athens that had gyros for very cheap and on the go. It was the perfect place to stop anytime for a quick bite and the chicken gyros with yogurt sauce, tomatoes and French fries is something I will always be craving from this trip! 2. Thisoview – This was where we had our big welcome dinner on the rooftop of the restaurant with a great view of the Acropolis. although we had three courses, my favorite part of the meal was the feta cheese appetizer. It is basically a block of feta fried in sesame seeds with honey drizzled over the top…is your mouth watering yet? Sooooo good. 3. Coffee Island – Although some might not consider coffee a type of food, it is very important to my life, so I put it in the same category. 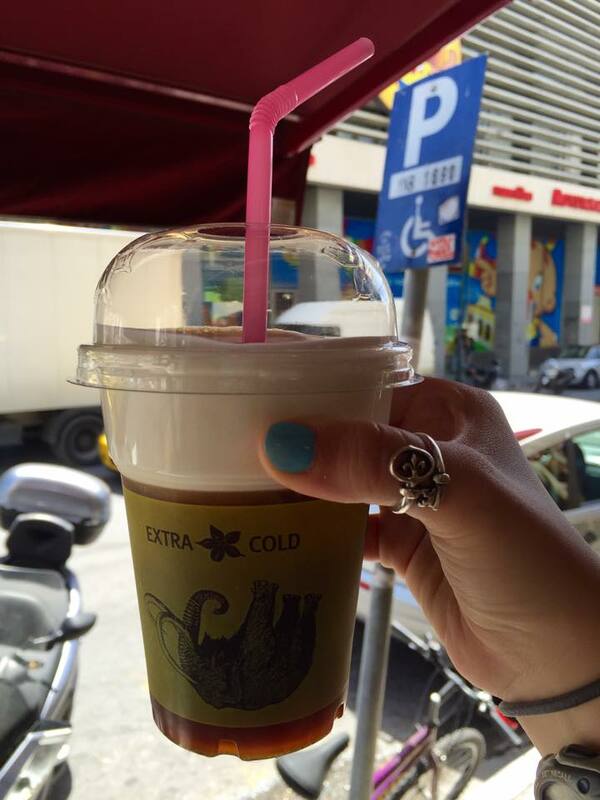 This coffee bar served the BEST freddo cappuccinos in Athens. I basically got one of these everyday at some point cause let me tell ya, the Greeks love their coffee all day everyday. If you ever visit Greece, hit up these foods/drinks and I promise you won’t be disappointed. yasas!